Hi, everyone! 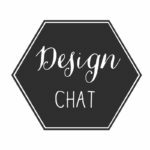 It’s Shane and I’m back for another installment of Design Chat! 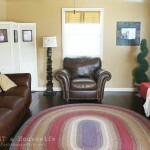 In our last discussion we talked about the basics of adding architectural interest to our homes. Since then I have been taking some time to really consider what this next discussion needed to be about, and I decided that the best way to go about it is from the top-down. Today I would like to discuss ways we can add architectural elements and interest to our homes with our ceilings. There are many decisions that are made in the design of a home before it is ever built, but when it comes time to decorate or change the style and feel of each room, one of the least considered changes ends up being the ceiling. There are many reasons for this (budget, layout, how easy/hard it is to reach, etc. ), but I would be so bold as to say that this can make or break the overall look you are trying to achieve. Changes to your ceiling can be as expensive or inexpensive as you would like. The trick is to figure out what will convey the look you are going for and still give you the most “bang for your buck”. Here are some examples of ceiling treatments and how they can affect the room. There are a lot of possibilities that can come from applying finish materials on a ceiling. 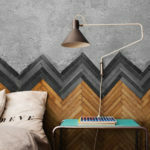 Like paint, this can really transform a room in a subtle or a dramatic way. Some examples are wood planks, tin sheets, paneling, staggered beams, molding, and coffered ceilings. Using many of these types of materials tends to fit a particular style of architecture, like Cottage style when using barnwood planks or staggered beams, or Period style when using tin sheets and coffered ceilings, but a fun and modern idea is to mix styles. What’s great is that technology has made things very accessible for a budget. If you can’t afford the real stuff, there are many companies that create vinyl and foam replicas that can be stained or painted to look like the real thing. 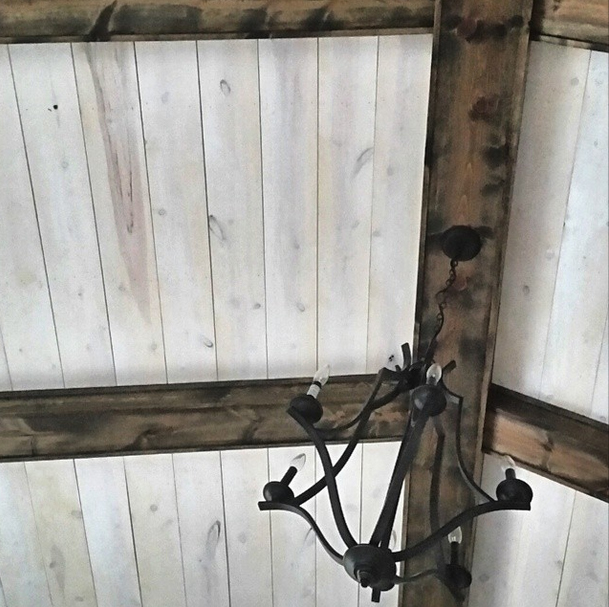 Traci from Cleverly Inspired white washed the planks in between the beams and then stained the beams darker for contrast. 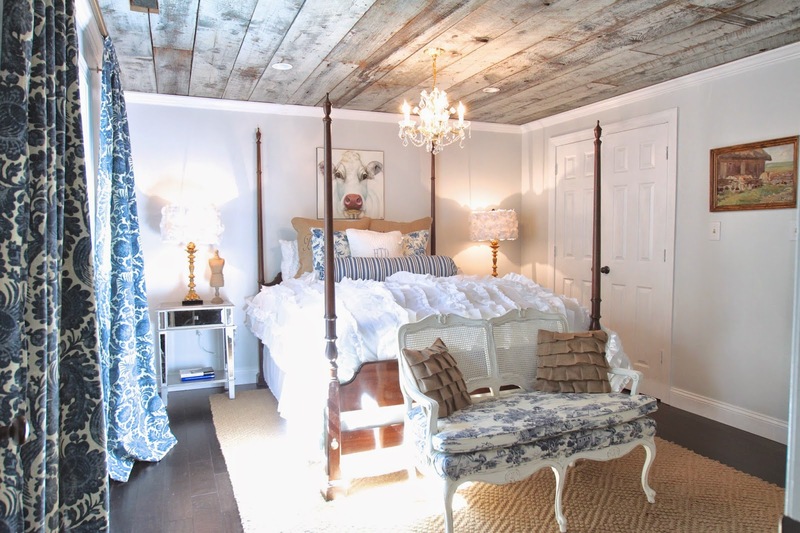 Heather from The Heathered Nest added barnwood to her bedroom ceiling which was the perfect touch! Suzanne from The Painted Drawer has painted beams that are so elegant! 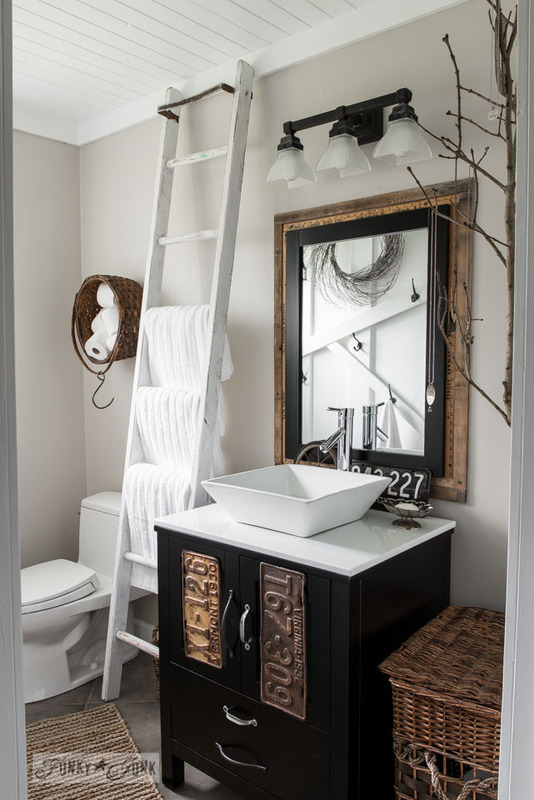 Donna from Funky Junk Interiors added white planks to her bathroom ceiling. 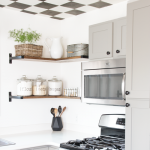 Brooke Giannetti and her husband chose a tin ceiling for their California beach cottage. 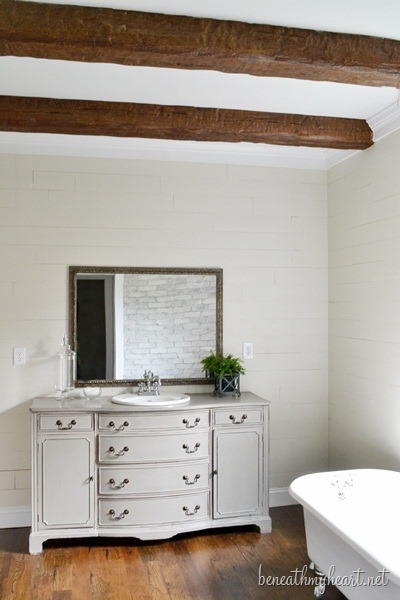 Traci from Beneath My Heart added gorgeous rustic beams to her bathroom. This Kitchen featured in New England Home has stunning coffered ceilings. If your rooms ceiling has roof trusses above, you may be able to open the ceiling up and create a vaulted ceiling. This would definitely be in the category of needing a contractor to be involved, but this can add quite a dramatic effect on your space. This kitchen from Better Homes and Gardens has Stacy and I considering opening our kitchen ceiling up! If your budget can’t quite allow for opening up your ceiling for vaulting, you may be able to “step” your ceiling. This is more commonly accomplished by adding soffits around the perimeter of your room which creates a vaulted feel in the center. You may want to have a contractor come and give you a bid to see what possibilities can be achieved. Depending on your house layout, you may consider having certain rooms with a dropped ceiling. This can give a heirarchy to rooms, allowing one room to stand out while the other is subdued. One good example of this is found in modern day built homes, where a living room, a dining room and a kitchen are designed together to create an entertaining space. Dropped ceilings can be used to create an illusion of a defined separation of space without putting up walls. If you budget does not allow for structural changes, you can make a dramatic statement with something as simple as paint! This is one treatment that I don’t feel I need to sell anyone on very much, except where color is concerned. The thing that is important in all color and material choices is “weight”. What I mean by this is that colors can create an actual feeling of being weighed down or weightless depending on what you choose. The rule of thumb here is to always remember balance – whatever your color choice for your ceiling, there are elements to every room that can determine whether this will be a success or not (i.e. size of the room, height of the ceiling, amount of light, floor color, etc.). You could also use wallpaper or fabric for a similar look. 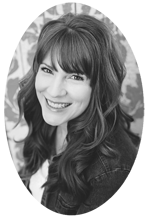 Stacy’s stenciled ceiling in our bedroom landed her in the pages of Better Homes and Gardens. 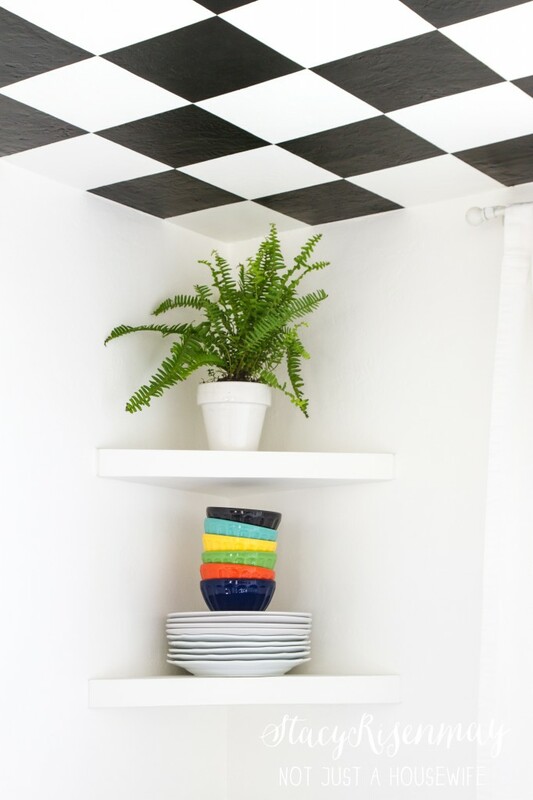 Stacy recently painted a black and white checkerboard pattern on our dining room ceiling and is prepping to do the same in the kitchen area. Room reveal coming soon! Maximizing the most amount of daylight can really pay off where ceilings are concerned. 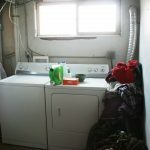 In some cases you may even be able to add light shelves to bounce as much natural light up into your room. An excellent use of vaulted ceiling space is to add one or more skylights. This can act as your natural light source, if it is hard to achieve otherwise. And another form of adding natural daylight to difficult spaces are solar tubes. These collect and reflect natural daylight throughout the daytime hours, and you can add electric lights within the tube for functional nighttime lighting as well. 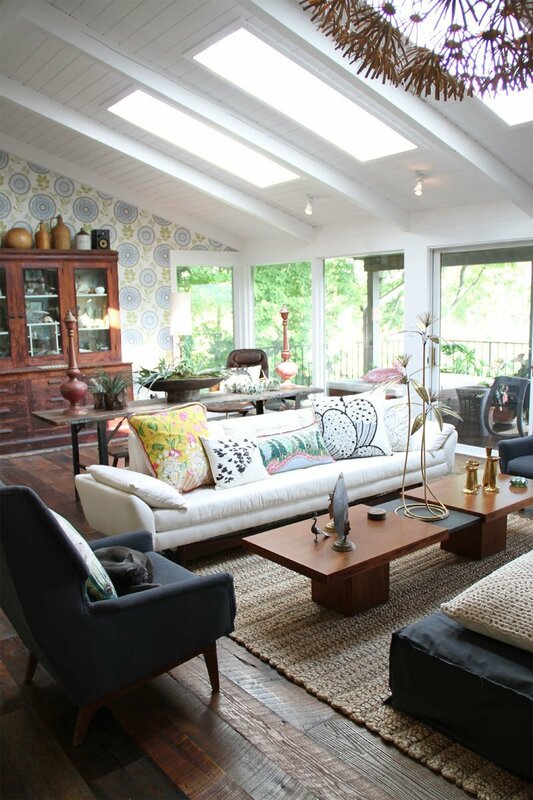 Amy and David’s skylights add beautiful natural light to their Ohio home. Every well designed room takes advantage of not only natural lighting but light fixtures, lamps, and table lamps. Thoughtfully consider the lighting needs in all areas at all times of the day and evening. You can go bold and the lighting will be what makes your ceiling unique or you can add something subtle. Thanks for reading! And stay tuned for the next part in our discussion about “Adding Architectural Interest to Your Home – Walls”! 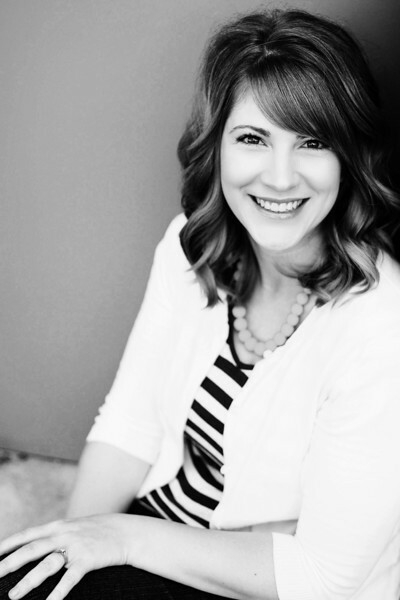 Ohhh my gosh… I love that black and white checkered ceiling! Seriously, they’re all so beautiful. I’d love to cover all my popcorn ceilings but wow. That is a LOT of work. 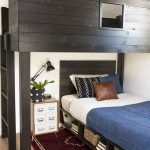 But maybe some wider planks… seriously loving that bedroom shot. Thanks so much for including me in this lineup, Shane! Great post! I love all the ceilings. It’s one of those things you don’t really think about until you see all these beautiful options. I am dying to have coffered ceilings in our current “formal” living room. I’d love to turn it into the dining room or an office but with no overhead lighting I feel the best way to add the wiring without destroying the ceiling is coffering or hollow beams! Pinning this for the future! Great post! I realize the various ceiling options I have throughout my house is probably one of the favorite features of my home. For instance, we painted all the walls throughout the open floorplan in our home in the same, neutral paint and the ceilings in each of the bedrooms are colors to define the “color scheme” for the particular bedroom. I painted the ceiling in the master bedroom a light lavender gray color. Various times of the day it changes depending on the lighting and resembles the sky…I love it! The one thing I’ve been wanting to add, for years, are skylights in our vaulted living room. Even though we have lots of windows downstairs, the way our house is positioned our house is still very dark. I would LOVE the light from the daylighting option! 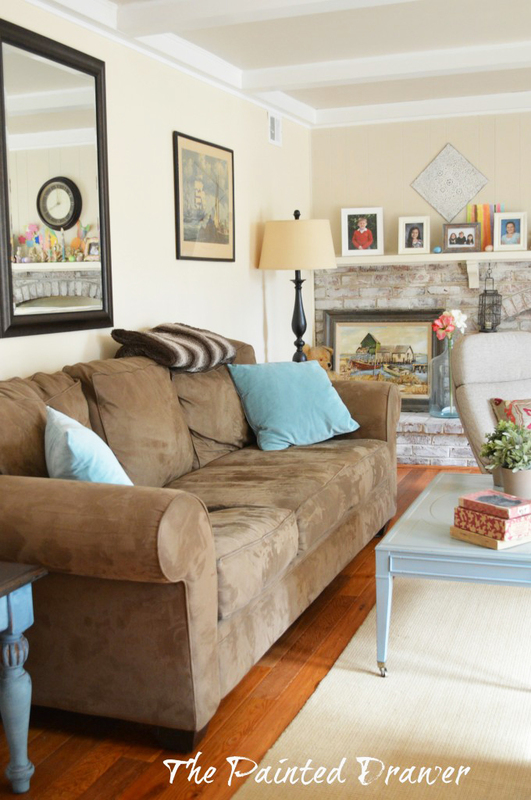 That inspiration pic above with the skylights could be similar to how my living room could look! :-) The main thing holding me back (well, other than the cost) is the worry of additional heat it might add to our living room. I LOVE all of your picks . . but I’m really digging that checkerboard ceiling. I want that in my studio! Hi there – sorry but I have been credited for work that is not mine. I believe the bedroom featured is from The Heathered Nest. One of my favorites but sadly, not me ;) You may want to quickly change it and give her credit. Cheers. Sorry, it is the second room from the top. I realized my comment could be confusing! Cheers, Suzanne at The Painted Drawer. I love-love-love that ceilings in your kitchen and dining room. I’ve looked all over your blog for a mention of them and haven’t been able to find anything. Did you paint the checkerboard? Is it a stencil or is it taped? 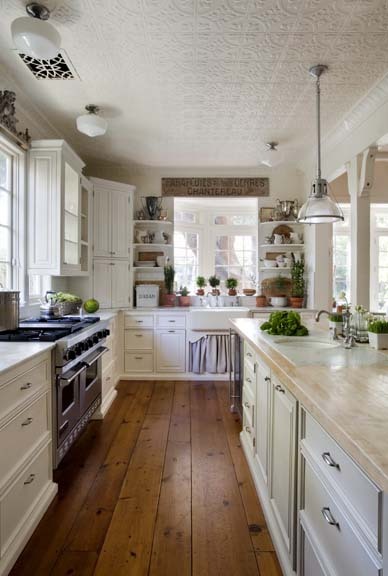 Your kitchen is beautiful – love the green and white! I’m redoing my kitchen in the same color of green and would love to do the ceiling also. The kitchen is small, so I don’t think it would be hard to do something exciting in there. Thanks! Love that white wash ceiling, how would you get that look with pine?